Happy New Year! Wow, what a year 2017 was! The enthusiasm and interest surrounding our 968s continues to grow as the cars were featured in numerous articles throughout the year. In addition, their values continue to climb and we saw a number of record sales in 2017. Although that is all good news I know you are like me and you’re just a big fan of the model in general. Still, all of the above is a good thing because that means more 968s will be saved and we’ll hope to see continued replacement parts offerings to support our special cars, something we need to keep an eye on. Along with all that great news you will probably not be surprised to learn that the PCA 968 registry had a great growth year as well. During 2017 we had 69 new 968 owners signup for the registry bringing our total number of members to 473!!! Wow! So, I hope we continue the growth trend in 2018 and you can do your part helping by getting that 968 out there. 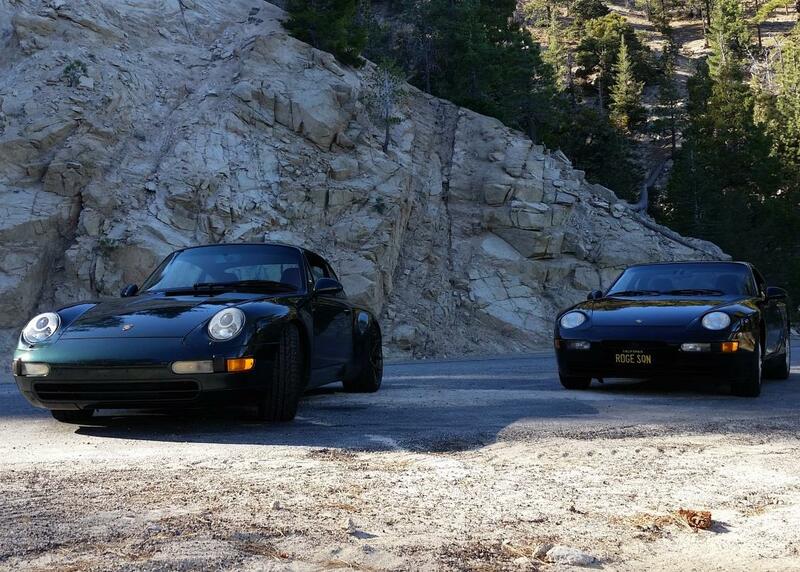 PCA offers so many great ways to enjoy your 968 so just pick one and go. The 968 looks as good today as it did in the early nineties and Porsche/Car enthusiasts are always happy to see them and check them out. As always, if you have something you would like to share with the group just send it along and I’ll get it in a future newsletter. If you have an event or gathering that you would like to organize let me know and I’ll be sure to mention it in a future newsletter. As you know from the register website, the 968 was available with 98 different interior options during its small 4 year production run. Blacks, greys, blues and cashmeres are plentiful from a 968 perspective but if you wanted a red interior you only had two choices. Both of those red choices cost big dollars back in the nineties as they were not only full leather interior options but SPECIAL full leather! For the earlier 968s (92-94.5) we had the Matador red leather option where the later 968s got the Flamenco red leather option. 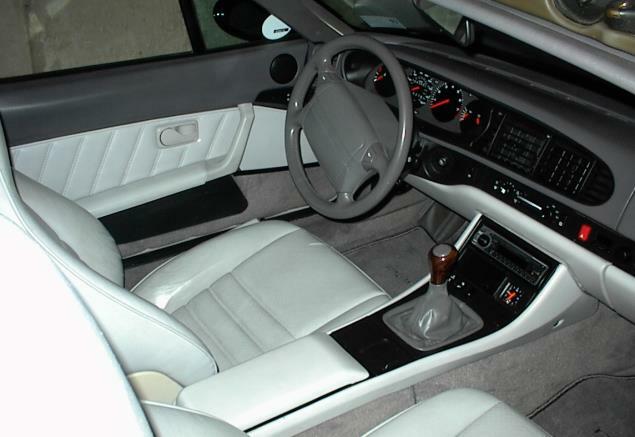 Both of these full leather interiors cost close to $5,000 back in the day (approximately $8,000 today). These red interiors are quite striking because they use a lot of black. The entire upper headliner area (on a coupe) remains black. The A pillar covers, sun visors, upper dash, and upper door panels are also black. 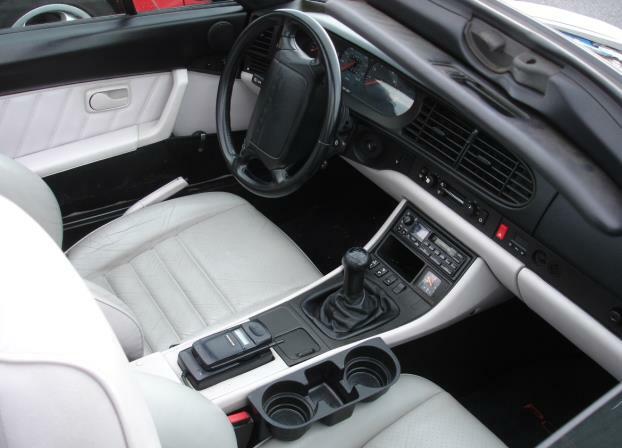 In fact, the interior is pretty much black with the following exceptions covered in red leather; the seats (but not the plastic corner pieces), the lower dash, the console and console door, the door panels and door panels pulls, and the e-brake handle. The carpet is also red. That’s it. They didn’t even offer the floor mats in red. You had to get black. The other nice thing about the red is that it is a nice darker shade, more like an apple skin, rather than the bright Lipstick red that you would find on a C4 Corvette of the same era. When North American 968 production came to a halt at 4,242 coupes and cabs only two cabs and three coupes had been equipped with these special order full leather red interiors. 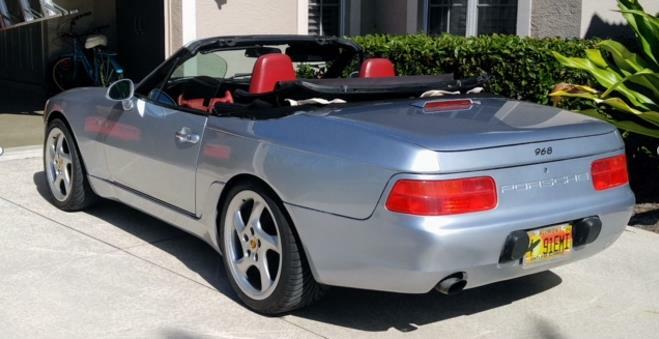 Every month I receive new registrations from 968 owners looking to be a part of the PCA 968 register and in November I received an application from Jim in Florida looking to register his 968 cab. Jim is the proud owner of a sharp polar silver cab. With grey hues being so popular on today’s new cars it is no surprise that the period Polar silver color looks right at home on the 968 and Jim’s “1 of 134” car is no exception. But then I stopped short as I perused the application because Jim’s car was a significant one based on what was INSIDE his car, a factory red interior!!! 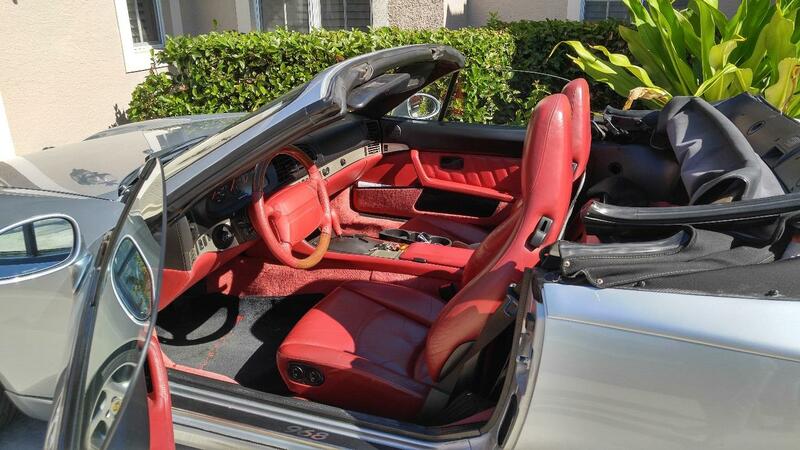 Recall from above that only five 968s had the red interiors. Of those five 968s, four had white exteriors. The other remaining red interior 968 was polar silver, Jim’s car. Talk about a rare sight, the car is a true one of one. The car sports the optional tiptronic transmission in addition to the amazingly rare, $4,603 ($7,900 in 2017 dollars) full leather interior in Flamenco red. Jim reports that the car was sold new in Houston Texas and went through a couple of owners before it ended up with him in Florida. Jim has a full collection of maintenance records proving that the car has been well cared for. He went on to tell me how often he is stopped by other auto enthusiasts looking to pry the car from his ownership but he loves it and has no plans to sell. I’m really not a red interior fan but I do like how they handled the execution in the 968, hence my decision to take on the Matador red interior 968 project that now sits in my driveway. I can’t wait until I get to the interior portion of the project. So, welcome to the registry Jim and take care of that very special, “1 of 1” 968. PCA 968 Register member Daniel Sokol had the rare opportunity to represent the 968 clan in a PCA photoshoot and associated article. If we could have picked a 968 to represent us in a comparison article I don’t know if we could have done any better than Daniel’s car. He is the proud owner of a rare black M030 coupe equipped with sport seats and LSD so talk about a “ringer”! Dan was kind enough to share his experience with us below. Keep an eye out for the article in a future issue of Pano. And I think I can speak for all of us in congratulating Daniel on his accomplishment. Way to represent Dan! As I drove up Angeles Crest Highway on a foggy/rainy Halloween day, I thought back to how it all started. 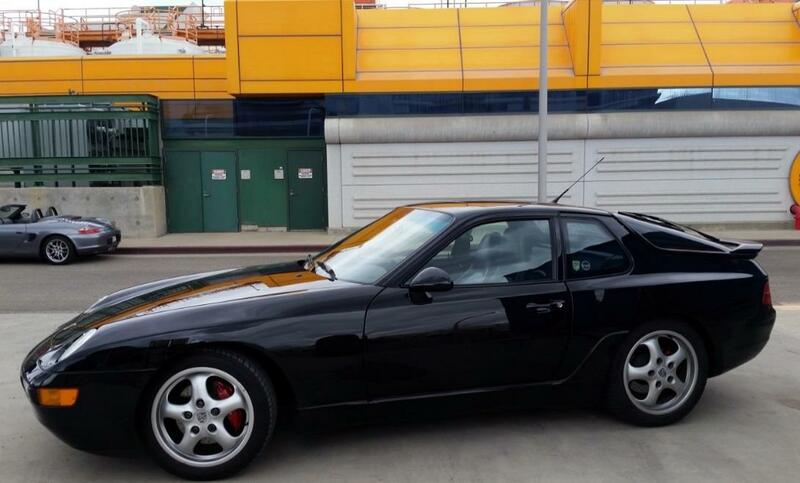 “PCA wants a 968 coupe for some pictures.” That is how the email from Jeff started. This started a chain reaction of emails between the PCA coordinator. They loved my car’s options, M030, LSD, and sport seats, and thought it would be perfect for the article, except that is was black. “We will get back to you,” is what the email said. I wrote off the photoshoot. Then a week and a half before Halloween, PCA circled back and said that they wanted to use the car. After getting the car detailed, which was the reason it probably rained, I now found myself following a 2003 Boxster S, a 993 Carrera (the author’s car), and the videographer’s FJ cruiser looking for a clearing in the weather. Our First Stop. Still Trying to find some natural light. The article’s subject was the “Last Analogue Porsches.” So the cars had to still have mechanical shifters, throttle linkages, etc to qualify. It was going to be two days, one day on Angeles Crest Highway driving for the videographer, each other’s cars, and letting the author have a go at the car. The second day was a photo shoot at the Hyperion water treatment plant. It was an interesting experience watching how they set up each driving shot, with everything from us driving under drones, having the videographer and the sound man ride along, and having the camera mounted to hood and hatch areas. We spent a lot of time on day 1 looking for good lighting, and found several places for good driving video shots. It was a combination of a lot of standing around interspersed with minutes of driving for the camera. The camera could be a drone flying overheard with my driving under it, or with the camera mounted to the hood or hatch, or even with the videographer or soundman in the car recording. While waiting for the videographer to video my car, the author and I snuck in a drive in my 968. While I do not want to put words into his mouth, he liked how intuitive it was to drive. You point it and it goes. I think he was a little surprised at the interior as well. 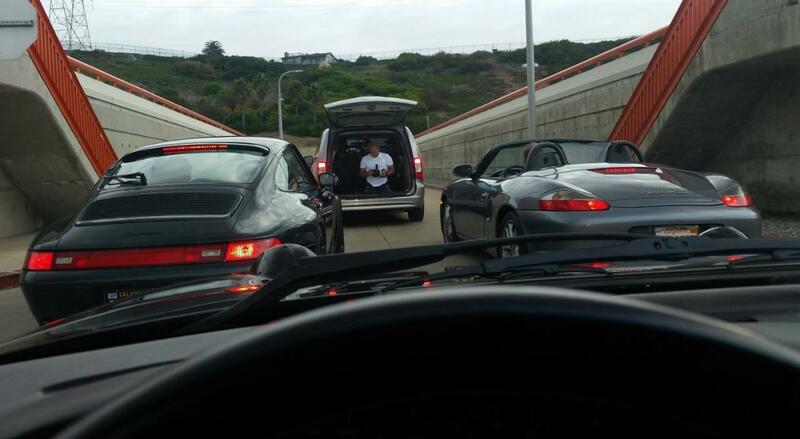 While it does not have the same layout, he noticed that a lot of the controls were the same as his 993. On day 2, we spent an entire day taking still beauty shots, and slow driving shots at the Hyperion water treatment plant. The weather was overcast for most of the day. In addition to “beauty shots” of the cars, he also took car to car and photos of all of us driving together. Driving 10 mph, a foot or two off of someone else’s bumper, and staying in position for the picture while going around corners, gives one a greater appreciation for those who do it at much higher speeds, say any aerial demonstration team. 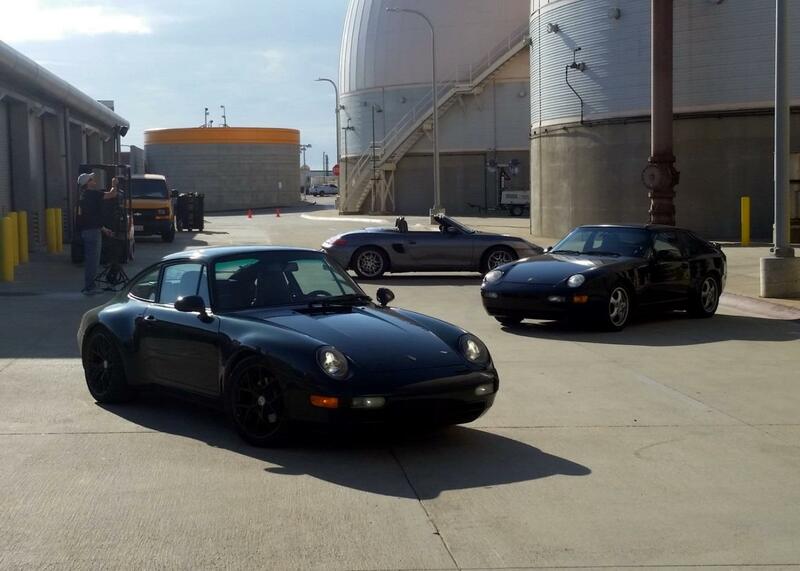 The photographer also took car to car pictures and remarked how it was easier to take pictures from the 968 than the boxster, which was the opposite of what I would have thought. Go figure! The driver interviews occurred during the beauty shot session. It is hard enough to answer interview questions on camera, but it gets more complicated when you have to stop your answer as a 737 or 757 roars overhead taking off from LAX. While standing around, the author asked to drive my 968 again. It was the first time he had driven a transaxle car, and he was having a hard time wrapping his head around the car. He got to drive the 968 a whole 10 mph! (the plant’s speed limit) I think even after that drive, he was still trying to figure out the 968. The 968, Ready for her beauty shots, rocking the 968 registry sticker! After two full days of filming and discussions, it was time for the writer, videographer, and photographer to head back to their respective locations and make sense of what they had experienced. It was an interesting experience, being involved with the video production, photoshoot, and the interview. The car was the star, while I was taking all of the direction. It will be interesting to see how it all comes out. As you have seen on the interior section of 968register.org there is a group of 968 options that I don’t know a lot about. Those are the five digit interior options. One of those options that I will highlight with this issue of the newsletter is the deviated carpet option. This was a smart and very reasonably priced option ($63, $65, or $75 depending on the year) that few dealers were aware of so it was ordered on just a few select 968s. For this extra cost you were able to select a carpet color other than the default color that would normally be found with your interior selection. 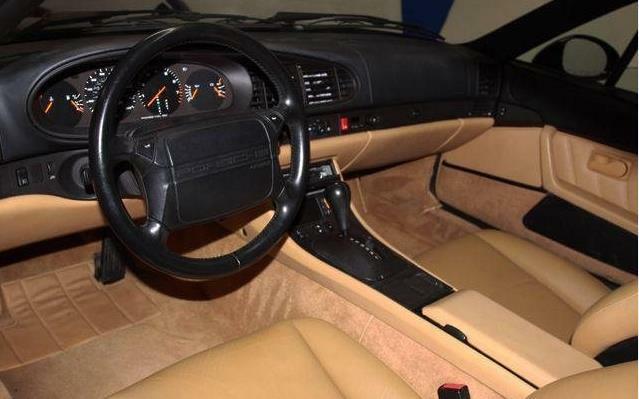 So, why would you want deviated carpet in your 968? 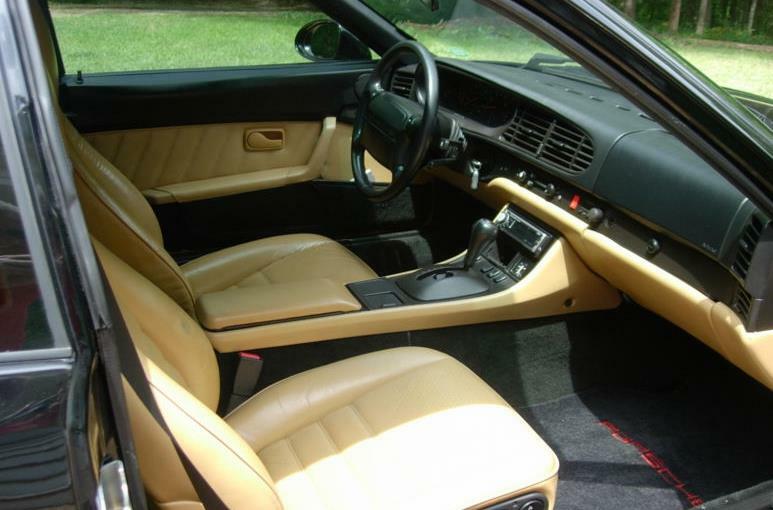 Because it was a particularly good choice on 968s that came equipped with light colored carpets. For instance, the base carpets on the light grey or marble grey two tone interiors would be a very light grey, almost white, in color. I would imagine they would get dirty almost immediately. My old cab had the code TU light grey/classic grey interior but the dealer had ordered the deviated carpet in classic grey. It looked great and it was so much more practical. 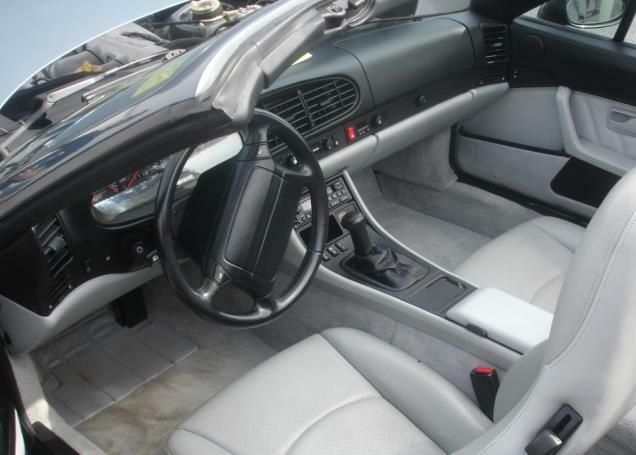 You will also see a few cashmere interior 968s with deviated carpets in black. Deviated carpet used a number of option codes, some of which specified not only deviated carpet but the specific color of the carpet. Some of the deviated carpet codes are 15801, 13941, and 16831. You can see a couple of examples below of the same interior offerings with both the standard carpet and the optional deviated carpet. Below is the code TU interior Classic grey/Light grey. On the left you’ll see a 968 with the standard carpets in light grey. On the right, the deviated carpets in classic grey, matching the upper trim. Below are light grey/marble grey examples. On the left you’ll see a 968 with the standard carpets in marble grey. On the right, the deviated carpets in black, matching the upper trim. Below is the code LC interior Classic Cashmere/Black. On the left you’ll see a 968 with the standard carpets in cashmere. On the right, the deviated carpets in black, matching the upper trim. While we are on the subject of deviated carpet, in October I spotted a nice Midnight blue 968 coupe for sale that showcased a very unusual application of this rare option. 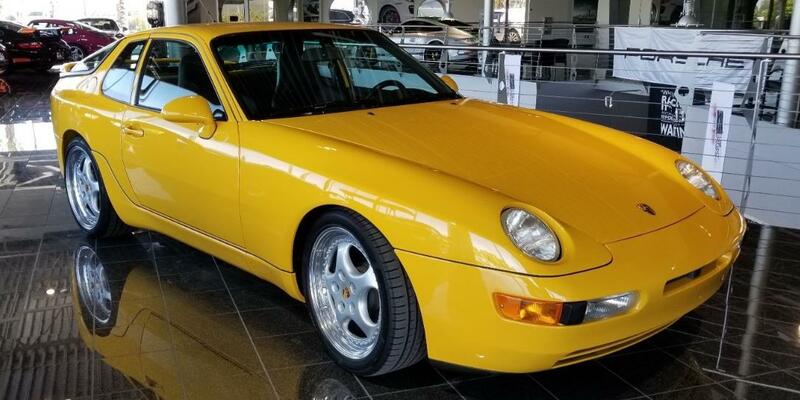 As noted, this 968 has the Midnight Blue metallic exterior and the code TS light grey/black interior, 1 of just 9 coupes produced with this combo. 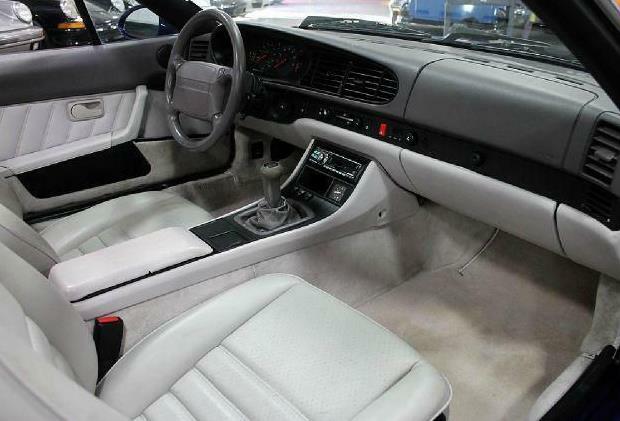 Typically, if the dealer was going to order up the optional deviated carpet to replace the light grey you would guess you would find black, like the rest of the interior but that is not the case with coupe. 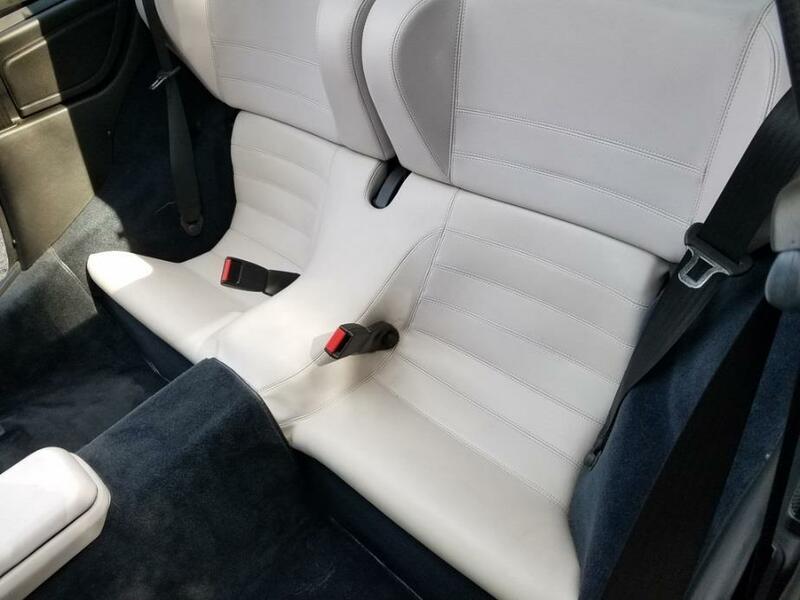 The dealer decided to go with a deviated carpet color that matched the EXTERIOR of the car rather than the interior so we find the deviated carpet in Marine Blue! Interesting and different. I’m not sure if I would have gone that direction but it kind of works and definitely makes the car unique. This is the first case that I have seen where the deviated carpet is of a different color than anything else in the interior. Nice. What do you think? One final note. On the cars equipped with it, note that the deviated carpet is extended to the door panel pockets! This is a way to tell if you are looking at a true deviated carpet car. 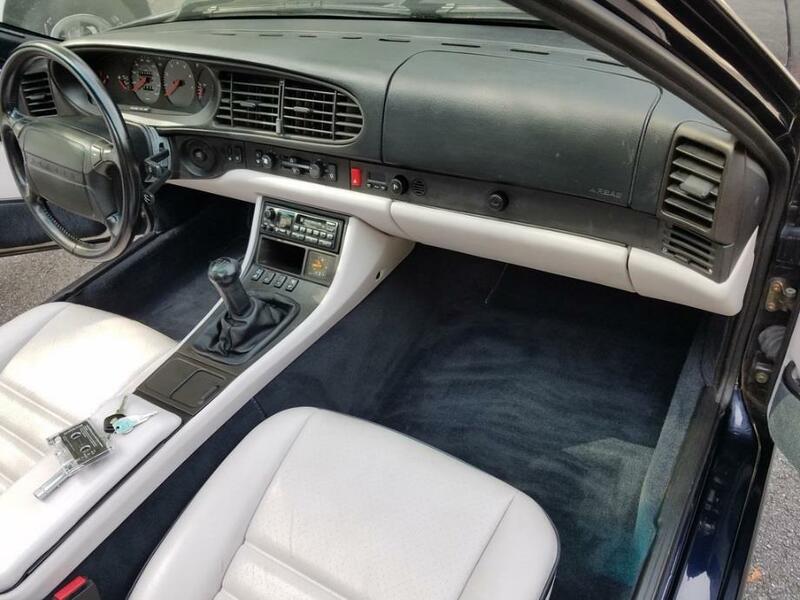 There are a few 968s out there that have had their lighter colored carpets replaced with black but the owners never bothered to replace the door panel carpets. 2018 PCA Swap at Hershey (PA) – Tentative date of April 21st. We may have a special 968 event in conjunction wit5h this event. Stay tuned for an announcement. 2018 Porsche Parade – July 8th – 14th, Lake of the Ozarks, Missouri. This looks like a great parade at a great location.